It doesn’t matter whether or not you are baptized if you do not believe. 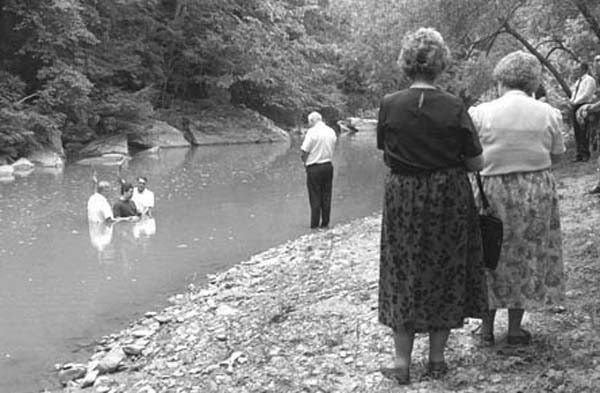 Baptism w/o faith – which is forced on infants and some adults too are immersed w/o faith – is a pointless work of man and of the flesh. For the Same reason, the Mormon “baptism for the dead” is a pointless and empty exercise. Because this is unquestionably true, that belief precede baptism, Mark 16:16 doesn’t need to say “whoever does not believe and get baptized shall be condemned.” If a person doesn’t believe, baptism is a moot point. The large portion of the denominational world argues against the necessity of Baptism (immersion) on the strength of the argument that Jesus only said unbelievers would be condemned: not that unbaptized unbelievers would be condemned. This argument would only work if the first part of Mark 16:16 did not say, “he that believes and is baptized shall be Saved.” Jesus makes it clear in positive terms that Baptized believers would be Saved. This part of the verse makes it illogical to say baptism has nothing to do with salvation. The first Baptist – early in the “reformation period” and long since passed away- believed two things: First, that immersion was for adults which put them at odds with the Lutheran & Catholic churches. Secondly, they believed & taught that baptism was for remission of sins which agreed with the baptism of the Lutheran and catholic powers. It’s important to know the first Baptist believed, as churches of Christ do today, that believing Adults are Saved by God’s grace AT baptism.